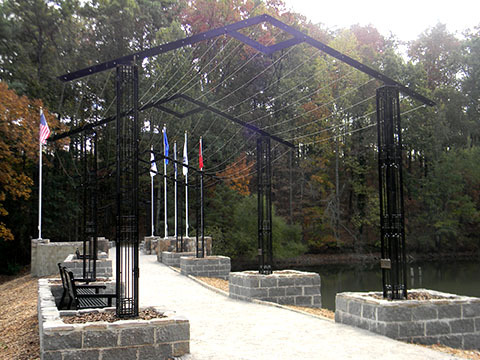 We are very proud to honor veterans through our Veterans Memorial Arbor spanning the 125-foot dam on our lake. It includes a ceremonial area overlooking the water and features all of the service branch flags, as well as the U.S. flag. The arbor has comfortable seating areas and will eventually be covered by flowering vines. It also features supporting cast iron columns with a unique appearance inspired by Prairie School architecture, which is most commonly associated with renown architect Frank Lloyd Wright. Even though the arbor has already been built and dedicated, the public is still invited to become an important part of it. A $2500 donation will purchase a bench, (one of five remaining stone benches at the Pentagon Plaza or one of six remaining steel metal benches at the arbor) that will include a plaque honoring an individual veteran or group of veterans you wish to remember. This includes all who have served our country and those who are currently serving now. Brick pavers are also available with a contribution of $250 each. The pavers are 9" x 9" and can be customized with four lines of text (with up to 15 characters per line including spaces). Also, there is a special paver that can include a Military designation and military service information. (Cost is $500 plus $85 set up fee). You will want to download the paver form (just below) in order to provide us with your customizing information. Then please mail us your paver form along with payment to Aldridge Gardens, Attention Veterans Memorial Arbor Pavers, 3530 Lorna Road, Hoover, AL 35216. For more information on this project, please contact our offices at (205) 682-8019. To reserve a bench in honor of a former or current service member, please use our online registration and payment form below. Please tell us who you would like to have honored.